We stopped for a few minutes and had a little picnic of Subway, love some Subway. Notice Jeremy isn't in the picture with me, I think he is attempting to avoid the blog. This is what I looked at most of the day. Oh and how do you like my motorcycle gear? By the way it is not a good idea to take a 60+ mile trip on a bike in a tank top and workout shorts...I burned big time. U.S.S. Cairo by the Mississippi River. At this point I thought Jeremy was pulling the bike around to pick me up. But since I wouldn't quit with the camera he kept going. So I started walking. When I finally caught up with him he decided he would just keep messing with me, because he is just so nice like that. We finally made it to the Confederate side! 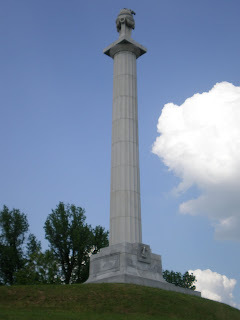 Louisiana monument. We headed home after this. Needless to say on the way home we ran into our dark cold clouds again...and they were cold cold! Luckily we didn't get any rain, until we were almost in Monroe...then we got a few sprinkles that luckily didn't turn into anything major until we made it home. It was a great time though. It has been so long since I've been on the bike for very long that I had totally forgotten how crazy it makes your skin feel to have wind hitting it going 80mph on the interstate for any period of time.